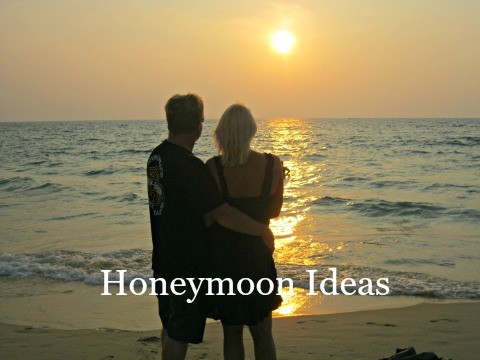 Are you searching for popular honeymoon destinations abroad? If so, come to the beautiful island of Phuket. We can assure you that once you and your partner arrive you will never want to leave. 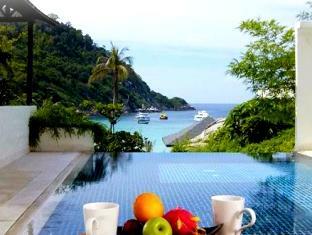 Phuket has long been a popular spot for honeymooners. After months of planning and stressful moments before your wedding day, a tropical island getaway provides the ultimate dream escape for couples. Phuket can provide this and much more..
You and your partner may wish to indulge your senses at one of the romantic luxurious resorts in Phuket. Or for the ultimate honeymoon island escape spend sometime relaxing on one of the picturesque offshore islands that surround Phuket. The tropical islands that surround Phuket are home to picture-postcard beaches, exotic culture and fantastic weather. Whether you choose to stay in Phuket or on one of the offshore islands or maybe combine the two, you won't be disappointed. 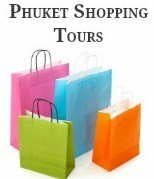 Both Phuket and the offshore islands have a fantastic selection of romantic resorts, luxury hotels, beach bungalows and private villas to choose from. These Resorts specialize in pampering couples with massages and Day Spa’s, beautiful accommodation, all set in peaceful surroundings with excellent levels of service. Below is a short list of some of the most popular honeymoon destinations and resorts, that we feel are worthy of mentioning, as top honeymoon destinations in Phuket and on the offshore islands. If you’re planning your honeymoon or just some romantic time away with that special person in your life, there are a number of amazing resorts in Phuket that are renowned for providing couples, friendly and peaceful surroundings. 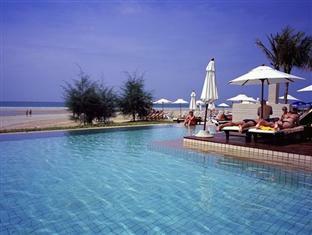 Banyan Tree Resort is located at Bang Tao Beach one of the best and most popular honeymoon destinations in Phuket. If you are after time alone with your loved one, this is the ultimate resort for your romantic getaways in Phuket. Read more on Agoda. Ayara Kamala Resort is a boutique hotel, the resort is set in a brilliant location on a picturesque hilltop overlooking Kamala Bay, great for couples looking for seclusion, making it the perfect destination for a romantic honeymoon in Phuket. Read more on Agoda. 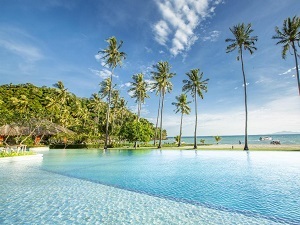 Andara Resort Villas are an all villa property located in the lush tropical hillside above Kamala Beach, offering breathtaking sea views and private infinity pools. 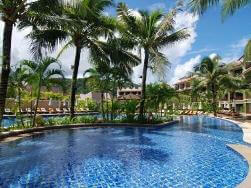 This is a perfect choice of resorts for the ultimate vacation and a popular honeymoon destination in Phuket. Read more on Agoda. 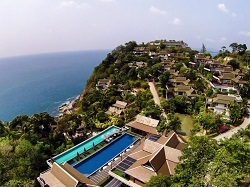 Alpina Phuket Nalina Resort is one of the finest first class resorts in Phuket. It is located just 700 meters off the beach in Kata. 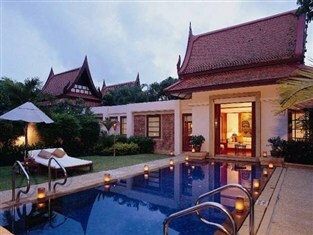 The resort's natural setting and high level of comfort makes it one of Phuket's best honeymoon destinations. Read more. Sri Panwa is a small luxury hotel, the pool villas offer complete privacy with an infinity swimming pool wrapped seamlessly around a glass-enclosed bedroom. Enjoy a romantic evening in your outdoor Sala, sipping on champagne whilst taking in the panoramic sunset views. Read more on Agoda. 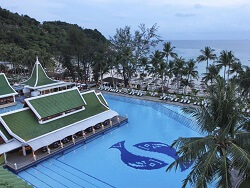 Le Meridien Beach Resort is located on a secluded beach called Relax Bay, this luxury resort is only a five-minute drive from Patong. Read more on Agoda. 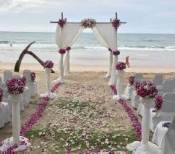 The Le Meridien is one of the best locations and resorts to plan a romantic sunset wedding and honeymoon in Phuket. The Racha Hotel is located on the island of Koh Racha, only 30 minutes by speedboat from Phuket. The resort overlooks an unspoilt beach and delivers a dream island honeymoon that you'll never forget. The Racha Resort offers all inclusive wedding packages and is one of the best honeymoon destinations. Read more on Agoda. Phi Phi Island Village Resort is located in one of the most romantic settings on Koh Phi Phi. The resort is ideal for honeymooners or couples that are searching for a romantic getaway on a tropical Island. Read more on Agoda. Apsara Beachfront Resort is located on one of Thailand’s most serene and beautiful beaches in Khao-Lak, Phang-Nga province. The quiet and unspoiled region makes for a relaxed romantic getaway in paradise, with an idyllic beachfront location and the crystal clear water makes this one of best honeymoon spots and a perfect resort for couples to enjoy their honeymoon. Read More on Agoda. 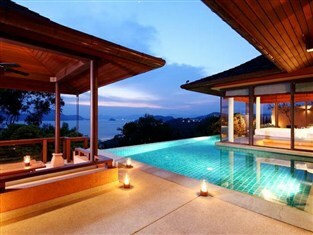 Phuket and the offshore islands are home to many popular honeymoon destinations and luxury resorts. As there are so many to choose from, it's wise to look around for the best honeymoon packages and destinations that are perfectly suited for you and your partner.